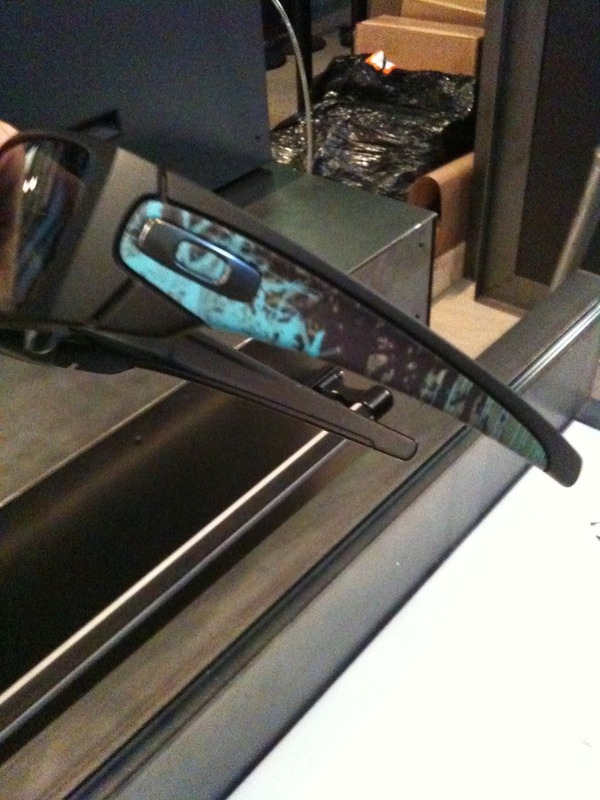 Check out some pics of the dye-sub-print-fusing process now available on the stems of custom Oakley Fuel Cell Sunglasses. 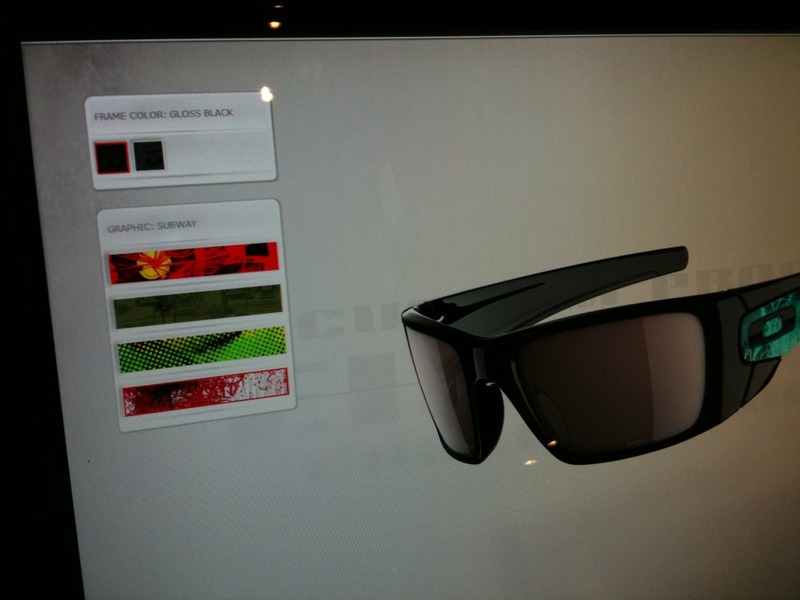 Sorry for the lousy iPhone pics, but the Lobby Store at Oakley Headquarters is now testing (and selling) Custom Fuel Cell Sunglasses with dye sublimation prints on the stems. You can configure your custom design using a touch screen interface. Currently, there are 4 patterns to choose from and multiple color options, but I’m sure we’ll be adding more in the future. Once configured, a sheet is printed out with the design which then gets fused onto the stem. It’s a pretty interesting process to see the design being “baked” on in the oven. You can see the sheet adhering more and more as time goes on. 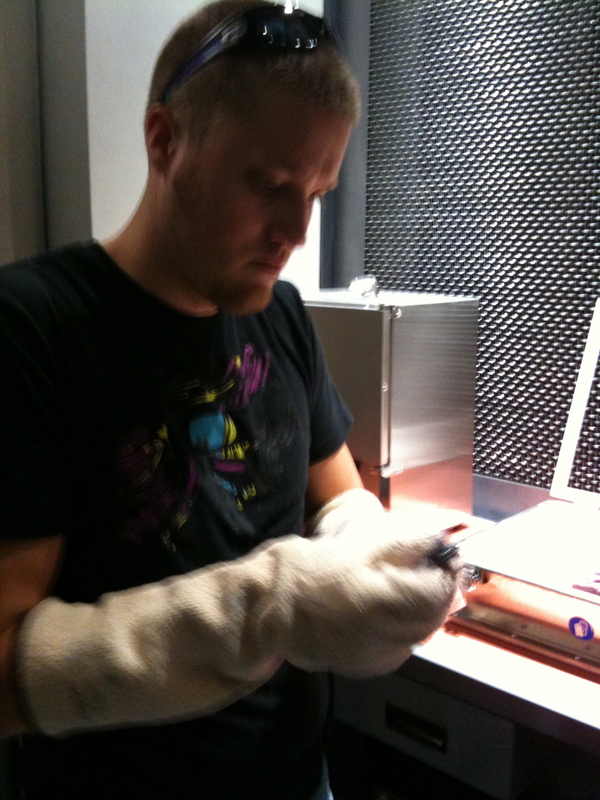 This is what it looks like after it comes out of the oven and the sheet is removed. The last two pics here show the sheet after it’s taken off the rubber stem holder. Here’s another stem detail before the gunmetal icon is applied, along with some blurry shots of it getting built and on my fat head. The light in our lobby is pretty low so it’s not exactly iPhone camera-friendly. If you’re in or near Orange County, come on down to 1 Icon in Foothill Ranch if you want to build your own. At present, this is the only location where you can get them done.